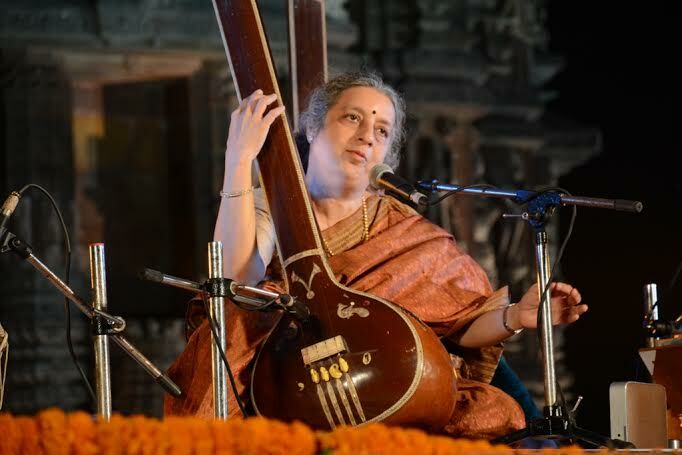 The concluding evening at the Rajarani temple witnessed scintillating performance on Hindusthani Vocal by Ashwini Bhide Deshpande and Sarod Music by Amaan and Ayaan Ali Khan. The first programme of the last evening was Hindusthani Vocal recitals by Ashwini Bhide Deshpande. Her first presentation was Raag Bhum followed by Bandish in Dhrut Tarana “Ab Man Lee”, “Ragan Ke Darbar Biraje Singhasan”, “Pawan Chalata” set to Rag-Paraj and her concluded item was Meera Bhajan “Mayeere Main To Gobinda Leno Mol”. She was accompanied in Tabla by Yati Bhagwat, on Harmonium Siddhesh Bichol Kar and on Tanpura Gourishankar Acharya. The second programme of the evening was Instrumental Sarod by Amaan and Ayaan Ali Khan. Their first presentation was Rag Jhinjhoti followed by different instrumental music set to different Rag and Tal. They were accompanied in Tabla by Satyajeet Talwalkar & Shubh Maharaj and on Tanpura Sumanta Kumar Maharana. The art connoisseurs were captivated by the superb presentation of the evening’s musical programme and were present till the end. The dignitaries who graced the occasion were Shri Asit Kumar Tripathy, Principal Secretary, Home; Shri G. K. Dhal, Principal Secretary, Tourism; Shri R. K. Mohanty, Director, Culture and Shri D. N. Mallick, Secretary, OSNA. The programme was compeered by Smt. Sangita Gosain and Dr. Arshiya Sethi.